My beloved friend EnnKa asked me today to tell more about us Dragons. She is a bit curious because she can’t remember me and it is surely interesting enough for mankind to take this as topic for a message. We Dragons are age-old Beings from a higher Dimension. Some of us are numerous thousands of years old. They are very wise and highly respected. There aren’t very much only a few thousand of our kind. Because we are now immortal there is no neccessity to reproduce steadily. It is reserved for Prime Creator to decide when an egg will be laid and who is allowed to lay that egg and what color it will have. The color of the egg specifies the color of the hatched young Dragon. The egg of my daughter Epirose is golden, therefore she will be also golden. 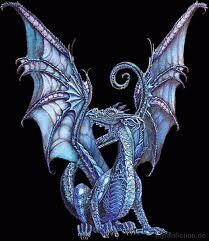 Dragons have many colors from green, over blue to red, brown, black, yellow, violet and very very seldom golden. We aren’t multi-colored but single-colored, at most our claws and part of our scales have varied hues. In size there are different variations from small nearly dwarfish Dragons through middle sizes to big Dragons like me. Common to all Dragons is the ability to fly. Some are not so good but others excellent. We have four feet with sharp claws like those of raptors, which we can move separately. We aren’t toxic, but can breathe fire when we are full-grown. Please don’t mistake us for reptilians. We are neither snakes nor lizards. Our body temperature is warm and our scaly skin is dry and warm too. Our wings are soft and sensitive. If we are not cautious, we can hurt ourselves. We dragons love the warmth and a sunbath serves us as nourishment as well as for relaxation. We don’t need to eat but we like clear water for drinking or bathing. Like all highly evolved beings, we can nourish ourselves through sunlight alone. Therefore you don’t need to fear we could see you or your gregarious animals as our food. We don’t kill, not even when we are attacked. We are very strong and the ability to defend ourselves without causing harm to our attacker. Aren’t we known as magical creatures? The greatest part of us lives on Sirius A. There we have been very cordially enrolled after our expulsion from Earth and live peacefully together with the inhabitants. We are friends and neighbors and some of us have a special connection to the elves. We feel an affinity for them like they to us. We can sense which elf matches us with his energy and nature. This connection usually will be established in the youth of an elf. EnnKa is my elf since many many years. When we both fly together, she on my back, our consciousness merges to one and she can steer me alone through her thoughts, through her intentions. Even, when we aren’t together we talk telepathically. Great distances cannot restrict that, because I submit her this message telepathically too. As we seldom have offspring, we care intensely for the eggs and the young Dragons. We take care of them very carefully until they are grown enough to take care of themselves. This is indeed no diffcult task for us, because we don’t have to look for food neither do we have to fear attackers. Most of the Sirians are highly evolved Beings and even those who live in the forth Dimension wouldn’t risk to come too near to our nest or to a young Dragon. In earlier times there have been such attempts until we made unmistakingly clear that we guard our children. Today this fact is known overall and we use the time to play more with our children and then to teach them how to fly. It is a nice time. I hope that you, my beloved people of Earth, fear us now lesser as you know more about us, our appearance and our lifestyle. I send you my love and the greetings of the Dragon Realm. I am Lady Ifegena from Sirius.